CNBC: ‘Brexit is a revolt against a German-run European super-state … the European Union will most probably come out terminally fractured’ COGwriter: Or will it reorganize? « Pope Francis pushing interfaith agenda in UAE: Is this dangerous? President Donald Trump … told Merkel that trade free-riding on the U.S. was over, and so was Washington’s total underwriting of German security. Apparently shocked by the lack of American solidarity (stupidity), Merkel’s response was that “Europeans truly have to take our fate into our own hands.” In other words, never mind, Germany will continue to bilk Europe. Many think Europe is doomed. But the Bible teaches that it will reorganize (cf. Revelation 17:12-13). The foreign ministers of France and Germany are due to reveal a blueprint to effectively do away with individual member states in what is being described as an “ultimatum”.Under the radical proposals EU countries will lose the right to have their own army, criminal law, taxation system or central bank, with all those powers being transferred to Brussels. The public broadcaster reports that the bombshell proposal will be presented to a meeting of the Visegrad group of countries – made up of Poland, the Czech Republic, Hungary and Slovakia – by German Foreign Minister Frank-Walter Steinmeier later today.Excerpts of the nine-page report were published today as the leaders of Germany, France and Italy met in Berlin for Brexit crisis talks. The firestorm raging across Europe following last week’s vote in the United Kingdom to leave the E.U. blew into a tumult on Monday when it was revealed that a new “superstate” is being considered under which individuals nations – or possibly former nations – would “lose the right to have their own army, criminal law, taxation system or central bank,” according to one report. The Daily Mail said the presentation came from Frank-Walter Steinmeier, Germany’s foreign minister, and Jean-Marc Ayrault, his French counterpart. We did a video about that idea about three years ago–European Unity to be like Hitler? The apostle, standing on the shore, saw a savage beast rise out of the sea; a tyrannical, idolatrous, persecuting power, springing up out of the troubles which took place. It was a frightful monster! Yes, the monstrous Beast power will rise up. The Brexit is NOT THAT reorganization, but fallout from it could be related to the Europeans to decide that they must support an autocratic superstate. Why would some European leaders push for a superstate now? Well, the UK was probably the biggest impediment to their goal of a European superstate. And that is a goal that many in the EU truly have. With the UK voting to leave, this has been a time to reassess the direction of Europe. Those who feared Europe wanted to become a ‘superstate’ are correct. However, not all the remaining nations in the EU want further integration, and ones like Poland certainly are not looking to increase the possibility of German dominance over them. There will be negotiations and proposals. But not full agreement (cf. Daniel 2:41-43). There will be economic and civil crises. Then there will come a couple of prophesied reorganizations in Europe (Revelation 17:12-13, see also Must the Ten Kings of Revelation 17:12 Rule over Ten Currently Existing Nations? 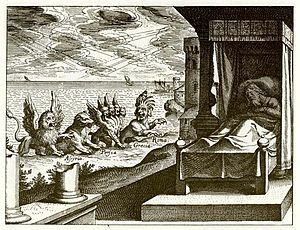 ), and the militaristic superstate that the Bible refers to as the ‘Beast of the Sea’ (Revelation 13:1=10) will arise. The monstrous superstate will come–and it will destroy the United Kingdom (and the United States and others for that matter, cf. Daniel 11:39). The Brexit vote is a push in that direction. A militaristic superstate will form in Europe! This entry was posted on Monday, February 4th, 2019 at 4:00 pm	and is filed under Prophecy.